This private tour in Spain is focused on the highlights of Palma de Majorca, and the most interesting places of Valldemossa. As your private guide in Spain I will show you some of the most popular tourist attractions in Palma. We will begin from the great ancient Cathedral of Santa Maria of Palma. The locals call it simply La Seu. It is a marvelous Gothic Roman Catholic Cathedral, situated on the place where an ancient Arab mosque used to be. You would be surprised but the construction of the cathedral lasted for almost four centuries and finished in 1601. Afterwards we will proceed to the famous Almudaina Palace. It is a famous tourist destination in Majorca which attracts thousands of travelers from all over the world. It is worth noting that it was built to serve as an Arabian Fort, and in the Middle Ages (approximately in the 14th century) it was stated to be an official royal residence. The Palace is definitely worth seeing and as your private guide in Palma de Majorca I strongly recommend you to visit it. Another famous landmark of Palma is the Llotja de la Seda, which is an outstanding example of late Gothic architecture. You would be stunned by its beauty and charm, so no wonder it was added to the UNESCO list of World Heritage Sites. After exploring Palma de Majorca we will proceed to Valldemossa. It is a small but definitely captivating village. 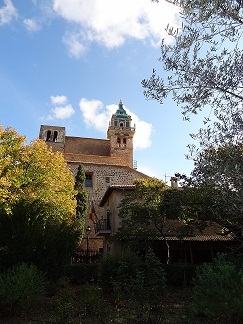 As your private guide in Spain I will take to the most popular landmark of Valldemossa – the Charterhouse. You should know that this edifice was built to serve as a royal residence, but due to some reasons soon it was converted into a monastery of the mysterious Carthusian order. Currently it is a museum, which consists of the major church, an old pharmacy, the former library, numerous cells and monks’ rooms, dining room and a beautiful garden. Group Size: up to 5 persons. For more price is under request. and the opportunity to see a beautiful place unlike any we have visited. You were an excellent guide, giving us the perfect combination of history, current events and the best hot chocolate ever!